The Forge Prize recognizes innovation in the use of steel. 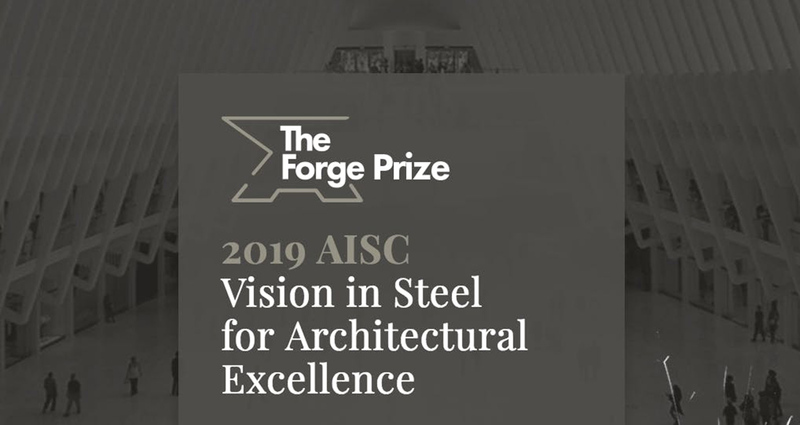 Established by the American Institute of Steel Construction (AISC), the prize invites practicing architects to submit proposals for visionary designs that embrace steel as the primary structural component. The Forge Prize is organized by the Association of Collegiate Schools of Architecture (ACSA) and is intended to engage designers in developing imaginative designs that bolster steel as the 21st-century building material of choice through a two-stage design challenge, culminating with a public announcement event of winners in Summer 2019. The final submission is required to be uploaded through the ACSA Competition website at www.acsa-arch.org by 11:59 pm, Pacific Time, on January 16, 2019. If the submission is from a team, all team members will have the ability to upload the final files.